Microsoft has announced two new Lumia smartphones running its Windows Phone 8.1 mobile OS, both focused on beefing up the portfolio at the lower end and expanding the platform’s appeal in emerging markets to try to compete with budget Androids. The Lumia 435 is the cheapest Lumia device to date, and the first 400 series device in Microsoft’s smartphone line-up. It’s being priced at around €69 ($81) before taxes and subsidies, bringing the platform within spitting distance of budget Androids (albeit, the latter’s floor extended below $50 last year so the race to the bottom on price is still not one Microsoft is winning). The second new device, the $93 Lumia 532, also further squeezes the price-point for a 500 series Lumia, after Microsoft unveiled the $140 Lumia 535, last November. Microsoft said its two new Lumias will begin rolling out to “key markets” in Europe, APAC and IMEA this February, with bright green, bright orange, white and black color options available, along with single- and dual-SIM variants. Specs for the 3G Lumia 435 include a 4 inch 800 x 480 LCD display, a 1.2GHz dual-core chip, 1GB of RAM, 8GB of internal storage and a 2MP rear camera. So it’s certainly going to be a budget experience. The Lumia 532 has the same display and form factor but its innards are beefed up to a quad-core 1.2 GHz chip. And its rear camera is 5MP. Microsoft touts built in Skype integration, noting its a front-facing camera supports video calls. Microsoft Office will also be pre-loaded on the devices, and Lumia 532 users activating a camera back-up feature will get 30GB of free cloud storage on Microsoft OneDrive. Microsoft’s Siri voice assistant competitor, Cortana, is also on board the Lumia 532 (and the 434 in select markets). So Redmond is evidently hoping to hook budget buyers onto its cloud services — to try to encourage longer term loyalty to its platform. Squeezing the Lumia price-point lower has been a project of multiple years for Microsoft, as it sought and failed to play catch up with Android’s low bar. And also for Nokia, the primary Windows Phone OEM, before Redmond out and out acquired the mobile making division of the company last year. In October 2012 the cheapest Windows Phone was the Lumia 510, which was priced at around $199. It followed the circa $222 Lumia 610 released in March that year. Both devices ran Windows Phone 7, the iteration of the platform that Microsoft orphaned in the switch to WP8. Then, in December 2012, came the cheapest Windows Phone 8 device: the $249 Lumia 620 — pushing the WP price-point back up a little. 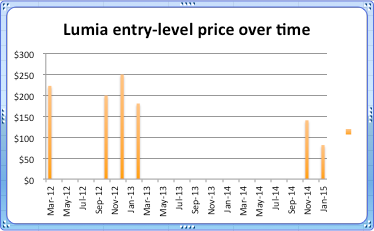 But by Febuary 2013 the Lumia 520 arrived to push the WP8 entry level price down to $180. Last September, after completing its acquisition of Nokia’s mobile making division, Microsoft released a trio of mid tier Lumias. And followed those up with the $140 Lumia 535. It’s since added a sub-smartphone device to its line-up: the $29 Nokia 215, which is a 2G feature phone with Facebook’s app pre-loaded. The Lumia 435 and 532 put Microsoft’s focus back on its budget smartphones. Its strategy at the very low end is to try to use Nokia-branded, non-Lumia featurephones to hook buyers onto Microsoft branded cloud services — and presumably then hope to push them to upgrade to a Lumia smartphone down the line. However the step up from $29 to $81 is still a relatively big one, given that plenty of Android devices will sit in between those two numbers, encouraging budget buyers in emerging markets to switch to Google’s platform. Still, Microsoft can at least console itself that its budget smartphones are priced and specced competitively vs Samsung’s first Tizen phone, the Z1, released today — for around $92, targeting India. “With many people looking to upgrade from a feature phone to a smartphone for the first time, Lumia 435 and Lumia 532 provide a balance of features and power, while also bringing Windows Phone 8.1 experiences to new price points,” Microsoft notes in a press release.